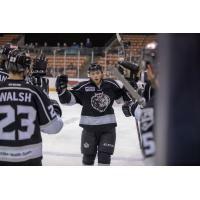 MANCHESTER, N.H. - The Manchester Monarchs dominated the Norfolk Admirals, 7-5, Sunday afternoon at SNHU Arena. The Monarchs (17-15-1-1) scored four second-period goals to defeat the Admirals (14-18-2-2) by a score of 7-5, extending their winning streak to four games. The Admirals scored early on a shorthanded goal, when Domenic Alberga scored his 9th goal of the season, at 4:32 of the first. Picking up a breakout pass and skating in all alone, Alberga sent the a shot past Monarchs goaltender, Cole Kehler, making the score, 1-0. The Monarchs answered at 7:59 of the first period when David Kolomatis scored his 7th of the season. Cory Ward sent a pass to Kolomatis at the blue line, where he wristed the puck past the glove of Admirals goaltender, Merrick Madsen, bringing the score to 1-1. The Monarchs scored again at 8:58 of the first period when Tony Cameranesi picked up his 8th of the season. Following Spencer Watson's initial off-angle shot, Cameranesi connected with the rebound, lifting the puck over the glove of Madsen, making the score 2-1. The Admirals tied it up at 5:47 of the second period when Cody Smith scored his 2nd of the season, wristing the puck off the cross bar and down over the goal line, bringing the score to 2-2. The Monarchs scored at 10:17 of the second when Drake Rymsha, scoring his first of the season, found the puck in the middle of a scramble in the blue paint and lifted it over the shoulder of Madsen, making the score 3-2. The Monarchs increased their lead at 11:23 of the second period when Spencer Watson scored his 12th of the year, gathering a pass from Cameranesi and wristing the puck past the glove of Madsen, bringing the score to 4-2. The Monarchs scored again at 13:30 of the second when Daniil Miromanov, scoring his 5th of the season, found the puck in the high slot and crept into the circle, sending a shot past the glove of Madsen, on the power play, making the score 5-2. The Monarchs increased their lead at 16:01 of the second period when Jared Fiegl scored his 2nd of the season. Picking up a cross-crease pass from Zeb Knutson, Fiegl launched the puck over the pad of Madsen, making the score 6-2. Cory Ward added a goal at :23 of the third period on the power play, before the Admirals scored two power-play goals and a shorthanded goal, late in the game, to bring the final score to 7-5. The Monarchs return to action Tuesday, Jan. 8 at 7 p.m., when they take on the Adirondack Thunder at the Cool Insuring Arena. For tickets, Season Memberships and group tickets, please contact the Monarchs front office at 603-626-7825.